Right now you can get this Shopkins Season 8 Plane Playset for ONLY $19.97 (Retail $29.99)! 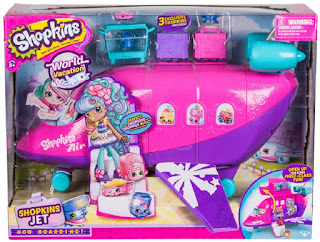 Welcome aboard Shopkins Air! - The cutest airline to fly the skies! The Shoppies are ready to take off on a World Vacation and want you to come along for the ride! Load your luggage into the overhead compartment then sit back and relax in high-flying style as the Shopkins serve up a flight full of fun! We really wish you were here… • Comes with 3 Exclusive Shopkins and Accessories!